One-ply cotton/polyester blend crocheted bandage. Provides softness, conformability, low lint, high absorbency. Ideal for securing dressings, I.V.s and splints or for providing mild compression or support. Holds securely to any body contour. Allows for movement and some soft tissue swelling. Stays in place with minimal taping. 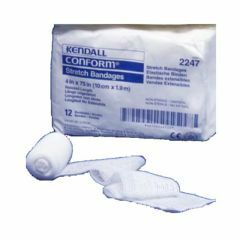 Conform Stretch Bandage Instructions for Use: Wrap CONFORM™ around desired area to provide protection, absorption, securement and support.